The options available from the Organize menu or the context menu for ReportCaster items (Schedule, Distribution List, Access List, Library Report, and Watch List) allow authorized users to select the following options. Open a Schedule. For more information, see How to Open a Schedule. Run a Schedule. For more information, see How to Run a Schedule. Delete a Schedule. For more information, see How to Delete a Schedule. Open a Distribution List. For more information, see How to Open a Distribution List. Delete a Distribution List. For more information, see How to Delete a Distribution List. Open an Access List. For more information, see How to Open an Access List. Delete an Access List. For more information, see How to Delete an Access List. Subscribe to a Library Report. For more information, see How to Subscribe to a Library Report. Open the last version of a Library Report. For more information, see How to Open the Last Version of a Library Report. View multiple versions of a Library Report. For more information, see How to View Multiple Versions of a Library Report. Delete a Library Report. For more information, see How to Delete a Library Report. Open a Watch List. For more information, see How to Open a Watch List. Unsubscribe to a Watch List. For more information, see How to Unsubscribe from a Watch List. Note: In Explorer, you can perform the following operations on multiple files simultaneously: Edit, Run, View Log, Cut, Copy, Delete, and Share. Select the folder where the items are that you want to access and select the List files in selected folder option on the toolbar. In the Change your filter drop-down list, select Schedule. Schedule is the default filter option. Select the Schedule displaying in the Explorer to open. Right-click the selected schedule and click Edit on the drop-down list, as shown in the following image. Select the Schedule displaying in the Explorer to run. Right-click the schedule and select Run, as shown in the following image. Select the folder where the items you want to access are located, and select the List files in selected folder option on the toolbar. Select the Schedule displaying in the Explorer to delete. Right-click the schedule and select Delete, as shown in the following image. In the Change your filter drop-down list, select Distribution List. 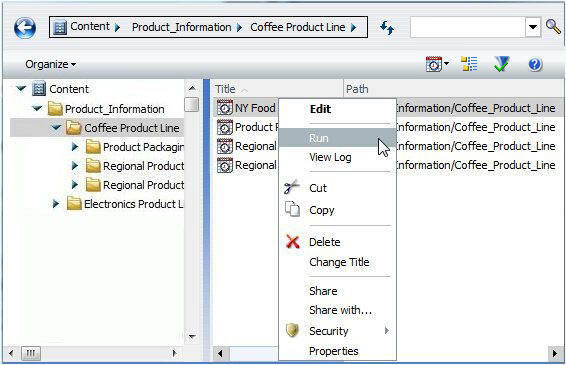 Select the Distribution List displaying in the Explorer to open. Right-click the Distribution List and select Edit, as shown in the following image. 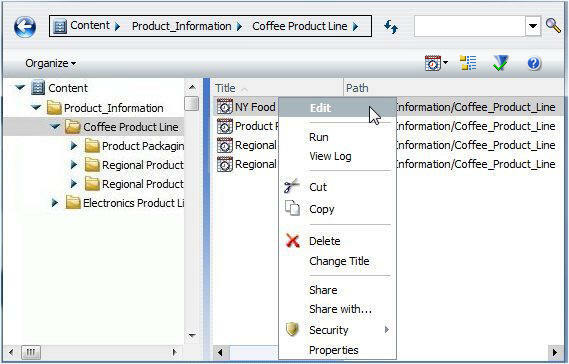 Select the Distribution List displaying in the Explorer to delete. 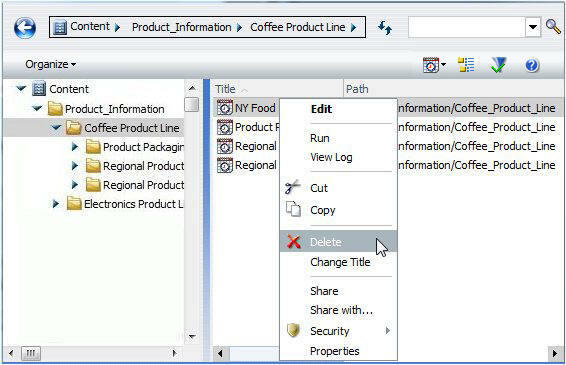 Right-click the Distribution List and select Delete, as shown in the following image. In the Change your filter drop-down list, select Access List. Select the Access List displaying in the Explorer to open. Right-click the Access List and select Edit, as shown in the following image. Select the Access List displaying in the Explorer to delete. Right-click the Access List and select Delete, as shown in the following image. Select the folder where the Library reports you want to subscribe to are located, and select the List files in selected folder option on the toolbar. In the Change your filter drop-down list, select Library Report. Select the Library Report you want to subscribe to in the Explorer. Right-click the Library Report and select Subscribe, as shown in the following image. Note: Once you have subscribed to a Library Report, the icon displays with a red circle in the bottom-left corner . Select the folder where the Library report you want to access is located, and select the List files in selected folder option on the toolbar. Select the Library Report displaying in the Explorer to open. Right-click the selected Library Report and select Open Last Version, as shown in the following image. Select the folder where the Library reports you want to view are located, and select the List files in selected folder option on the toolbar. Select the Library Report displaying in the Explorer for which to view multiple versions. Multiple versions of the Library Report display in the pane below the Library list report based on your selection. This is illustrated in the following image. Select the Library Report displaying in the Explorer to delete. Note: This is a Library report associated with the schedule. When it is deleted, you will not have access to any of the Library report versions distributed by the schedule until the schedule runs again. Right-click the selected Library Report and select Delete, as shown in the following image. Select the folder that contains the items you want to access. Click the Library Report for which you want to delete one or more versions. In the lower pane, right-click the report version and click Delete, as shown in the following image. Note: You can use the CTRL key to select multiple report versions for simultaneous deletion. To view a Library Report in a Watch List, you must Subscribe to a Library Report. For more information, see How to Subscribe to a Library Report. Select the folder where the Watch List reports you want to access are located, and select the List files in selected folder option on the toolbar. In the Change your filter drop-down list, select Watch List. Select the Watch List displaying in the Explorer to open. Right-click the subscribed item and select Open, as shown in the following image. Select the folder where the Library reports you want to unsubscribe from are located, and select the List files in selected folder option on the toolbar. Select the Watch List displaying in the Explorer to unsubscribe from. Right-click the subscribed Library report and select Unsubscribe, as shown in the following image.